LIMA — A pair of milestones were achieved in Temple Christian’s 78-39 boys high school basketball victory Saturday night. 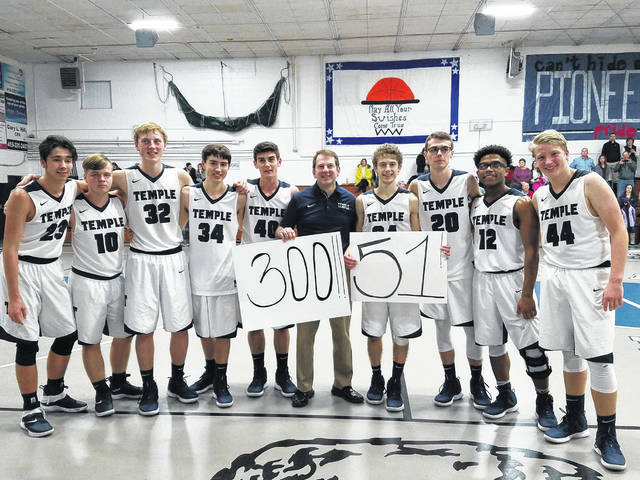 Temple Christian coach Bruce Bowman reached 300 victories and Brody Bowman set a school record with 51 points. Teammate Dawson Draper scored 12. DELPHOS — Jared Wurst had 19 points and Tyler Ruda and Brady Parrish each scored 14 for DSJ. Keegan Goecke had 14 points and Eli Harter scored 11 for Spencerville. NEW KNOXVILLE — The Rangers withstood being outscored 16-6 in the fourth quarter. Jared Osborne had 15 points and Sammy Anspach scored nine for New Knoxville. Ian Ricker and Reese Van Sossan each had eight points for Fort Jennings. NEW BREMEN — Trent Platfoot had 21 points and Aiden Reichert scored 10 for Jackson Center. Nolan Bornhorst had 19 points and Bryce Blickle scored eight for New Bremen. ADA — Jaron Sharp had 28 points and Jayden Cornell scored 20 for Kenton. Connor Frazier (17), Phillip Coulson (13) and Brandon Hull (11) each scored in double digits for Ada. COLDWATER — Owen Treece (16), Drew Bagley (15) and Blake Henry (11) each scored in double digits for Van Wert. Cole Frilling had 16 points and Marcus Bruns scored 12 for Coldwater. This entry was tagged templechristian. Bookmark the permalink.